I had started a thread months ago on this very subject, based on a Jack Wheeler article, The Chinese Christian Crusade. It told about how Christianity was simply taking off and how China would soon have more Christians than any other country. He also talked about The Back To Jesusalem Movement Led by the Chinese, and described their Mission Statement, and where they intended to concentrate their efforts. This map shows the â10/40 window.â Within the red lines live more than 90% of the worldâs remaining unreached people groups, and all 50 of the worldâs least evangelized countries. These countries are the focus of the Back to Jerusalem movement. Well lo and behold, others are starting to catch on to this massive movement that is going to change China in the coming years: for the better. BEIJING -- Chinese are embracing Christianity in a social revolution that is spreading through town and countryside to the point where Christians already may outnumber members of the Communist Party of China. Visits to villages in backward rural provinces or to urban churches in Beijing, where even on weekdays the young and middle-aged gather to proclaim their faith, confirm the ease with which conversions can be won. "City people have real problems, and mental pain, that they can't resolve on their own. So it's easy for us to convert these people to Christianity," said Xun Jinzhen, who preaches to customers at a beauty salon in Beijing. "In the countryside, people are richer than before, but they still have problems with their health and in family relationships. Then it's also very easy to bring them to Christianity." State-sanctioned Protestant and Catholic churches in China count up to 35 million followers, making Christianity the third most practiced religion in the country after Buddhism and Taoism. Islam ranks fourth. Even more significant is a steadily growing network of underground or "house" churches, which are said to have up to 100 million members. That compares with an official total of 70 million members of the Communist Party, many of whom have lost faith as the party has moved away from strict ideological principles toward increasing acceptance of free markets. Among the known converts are at least a few of the most prominent figures from the 1989 Tiananmen Square pro-democracy demonstrations, most of whom are now living in exile. These include Zhang Boli and Xiong Yan, both of whom were on a list of the 21 most-wanted student leaders that was published shortly after the Beijing massacre, and both of whom have been ordained as priests. Another is Han Dongfang , who converted through the U.S.-Chinese church movement. He arrived in the United States in 1993 after being released from prison on medical grounds; he had contracted tuberculosis in a Chinese jail and nearly died. "I think human beings need something at a spiritual level," he said in Hong Kong, where he discusses labor issues for Radio Free Asia. "We don't want to believe we are coming from nowhere, going nowhere." As a teenager, he was a passionate Marxist but, as an army recruit, became disillusioned over the luxuries enjoyed by the officer class. "When communism became this corrupted thing, which failed everybody, people still needed a belief. I think that's the reason for Christianity in China," he said. One of the driving forces of Christianity's growth in China has been its association with healing powers, particularly in rural areas where basic health services are lacking. One woman last month told a gathering of hundreds at Kuanjie, the official Protestant church in Beijing: "My brother's daughter had a virus, which doctors had never seen before. "She was on a ventilator and everyone had lost hope. But I prayed for her, and she recovered. Now her family follows Christ, too." The woman, 33, came from Anhui, a poor province of central China. In her village, she said, the house church had grown from five or six worshippers to 100 in five years. Mr. Xun, the beauty parlor operator, sees the growth of religion as a response to the increased materialism that accompanied the economic reforms put into place by Deng Xiaoping. "We have very few people who believe in communism as a faith, so there's an emptiness in their hearts," said Mr. Xun, 37. His mother also is a Christian, and his father, a retired county-level Communist Party secretary, is a sympathetic onlooker. China's rulers are said to be ambivalent about Christianity's growth. Some see its emphasis on personal morality as a force for stability. House churches, which accept the authority of official organizations, are often left alone. But many reject the party's control over Christian practice and doctrine, and these are seen as a threat. Overseas groups such as the London-based Christian Solidarity Worldwide say Christians are beaten regularly and one was killed in police custody. The beauty salon near Beijing Zoo gives its customers more than they bargain for: not just facials and manicures, but the Word of the Lord. Its owner, Xun Jinzhen, sees beauty salons as a good place to transform souls as well as bodies. "I introduced 40 people to the church last year," he said. Mr Xun, and millions of other Chinese Christian converts like him, may well be living proof that God moves in a mysterious way. During the Cultural Revolution, Chairman Mao's China turned on itself, torturing and killing hundreds of thousands of people. But the seeds were sown for an unexpected upsurge in Christianity. In a social revolution that has prompted a heavy-handed response from the Politburo, it is spreading through town and countryside and Chinese communities abroad. Protestantism and Catholicism are among the approved faiths, the others being Budd-hism, Taoism and Islam. Buddhism and Taoism claim most worshippers but the state-sanctioned churches count up to 35 million followers. More significant are the underground or "house" churches, which are said to have 80 or even 100 million members. "City people have real problems, and mental pain, that they can't resolve on their own," said Mr Xun. "So it's easy for us to convert these people to Christianity. In the countryside, people are richer than before, but they still have problems with their health and in family relationships. Then it's also very easy to bring them to Christianity." One woman told a gathering of hundreds at Kuanjie official protestant church in Beijing last Saturday: "My brother's daughter had a virus which doctors had never seen before. "She was on a ventilator and everyone had lost hope. But I prayed for her, and she recovered. Now her family follow Christ too." The association of Christianity with healing powers may be embarrassing in the West, but in China it is one of conversion's driving forces, particularly in rural areas, which lack health services. The woman, 33, came from Anhui, a poor province of central China. In her village, she said, the house church had grown from five or six people to 100 in five years. Religion - and superstition - took off as ideological fervour declined and materialism grew under Deng Xiaoping's economic reforms, which followed Mao. "We have very few people who believe in communism as a faith, so there's an emptiness in their hearts," said Mr Xun, 37. His mother is a Christian too, and his father, a retired county-level Communist Party secretary, is a sympathetic onlooker. Zhang Rongliang, the head of the China for Christ Church, said to be the biggest with 10 million members, was arrested last December and remains in prison. Scores of pastors and followers have been held, along with Roman Catholics, including underground bishops. Overseas groups such as the London-based Christian Solidarity Worldwide say Christians are regularly beaten and one was killed in police custody. Lawyers say the authorities try not to charge Christians with religious offences, for fear of criticism from abroad. Mr Xun, the beauty salon evangelist, has never been in trouble. But perhaps by coincidence, a week after he fired an anti-Christian employee, there was a police raid. It turned out the salon's acupuncture service lacked a proper licence. Mr Xun received a heavy fine, which he could not pay, and he was forced to hand over the running of the business to others. He wonders whether it was acupuncture that upset the authorities, or the Gospel. But here is one more of his articles. The deepest and darkest joke I've heard in a long time goes like this. Osama bin Laden prays to the spirit of Yasser Arafat who then appears before him. "Yasser, please help me understand something," requests Osama. "We're both fellow terrorists. You've even killed more infidels than I have. Yet you get the Nobel Peace Prize, your funeral is attended by heads of state from around the world, and European newspapers compare you to Moses, while I am the world's most hunted and hated man, reduced to hiding in inaccessible mountain caves. How did you do it? What is your secret?" Yasser breaks into a ghostly smile. "That's easy," he explains. "I only killed Jews." A deep joke always reveals a black truth. It is that the defeat of the Nazis in World War II did not exterminate Jew-hatred, it just temporarily suppressed it. It is that Jew-hatred did not originate in Arabia*, it originated in Europe. Islamic Nazis such as Arafat are no more the creators of the soul-disease of anti-Semitism than German and Vichy-French Nazis were decades ago. Jew-hatred is an ancient European sickness many centuries old. It began with medieval Catholics who vilified Jews as 'Christ-killers' (never grasping the absurdity, for it is only by Christ dying the way He did that that Christianity exists), and by the ultimate anti-Catholic, Martin Luther. Luther was convinced that Christ's Second Coming could not occur unless Jews, Jesus' own people, converted. He could forgive their refusal to do so given the wholesale corruption of Christianity by the Catholic Church. The solution to him was simple: Reform Christianity. Luther nailed his 95 Thesis on the castle church door in Wittenburg on October 31st, 1517 and created the Protestant Reformation in order to enable Jews to convert, thus bringing about the Second Coming. It never occurred to Luther that Jews were quite happy to be Jewish and would remain so whether the Christian Church was reformed or corrupt. There could be no justification for their not converting once his uncorrupt alternative was available -- when they didn't the only other explanation for him was that Jews were in league with Satan. And thus Martin Luther became Hitler's precursor. In a pamphlet Luther published in Wittenburg in 1544, Von den Juden und ihren Lügen (On Jews and their Lies), he demands a Christian Jihad against the Jews: "Set fire to their synagogues and schools, and bury with dirt whatever will not burn. I advise that all their homes be razed and destroyed. that all their prayer books and Talmudic writings, in which such idolatry, lies, cursing and blasphemy are taught, be taken from them. that their rabbis be forbidden to teach henceforth on pain of loss of life and limb. that safe-conduct on the highways be abolished completely for the Jews. dear Christian, be advised and do not doubt that next to the Devil, you have no more bitter, venomous, and vehement foe than a real Jew who earnestly seeks to be a Jew." These are the words of Martin Luther himself, written in his own hand. His bitterness and rage reach a crescendo in another letter he wrote in 1544: "If I had power over them (the Jews) I would assemble their most prominent men and demand that they prove that we Christians do not worship the one God, under the penalty of having their tongues torn out through the back of their necks." European hatred of Jews is an ancient hate, and periodically erupts from the darkness of men's souls into the light of history. Today in Europe -- particularly France -- another eruption has begun. It will get worse unless it is fought and opposed. It is getting worse because Jews are the Europeans' perennial scapegoat for cultural failure. Old Europe now faces demographic doom because its native inhabitants refuse to have children, and economic doom because they would rather go on vacation than work. You know how bad it is when Consumer Reports currently ranks Mercedes and BMW as the most poorly made of the world's luxury cars. To rescue Old Europe economically and demographically, to exorcize its Jew-hatred, it needs to be rescued culturally. There is only one way to do that, and only one group of folks to do it: American Christians. American Christianity was never infected with anti-Semitism to anywhere near the degree of European Christianity. Jews have been freer to flourish in America than anywhere else in the world. and so they have. Unlike their European counterparts, American Christians have the moral integrity to recognize Judaism as part of the basic foundation of Western Civilization (in America, 'Judeo-Christian ethics' is a term of praise, in Europe of contempt). Today, whatever remnants of anti-Semitism there were have been mostly expunged from American Christianity, which is why America is Israel's best friend on earth. 'Mostly' because Europhile liberal denominations such as the Presbyterian Church USA remain infected. Three times in the 20th century, America had to rescue Europe from itself. Twice with horrific loss of American lives, once with the staggering cost of the Cold War (Russians are Europeans too). Once again, in the first decade of the 21st century, America has to rescue Europe from itself - because to do so is to rescue Western Civilization. We cannot afford to have Europe subtracted from Western Civilization. We've got to understand that every heir of the greatest civilization history has ever known are all in this together with us (yes, even the French). Fighting for the continued survival of our civilization means fighting for the survival of the European soul. The way to do it? With missionaries. American Christian missionaries are in many of the world's remotest places working to convert primitive tribes. It is soon going to dawn on them that they need to be saving the heathen in Europe, not some lost jungle. Then it is going to dawn on them that they could form an alliance with an emerging Christian missionary movement that will be the largest the world has ever seen. Here's what's going to be happening, folks: American pro-Israel evangelicals and anti-abortion Catholics are going form a missionary alliance with the Chinese Underground Church movement. I wrote about The Chinese Christian Crusades a year ago (Behind The Lines, November 24, 2003). The present target of Chinese Christian missionaries is the '10/40 window,' encompassing northern Africa, the Middle East, and Asia between 10 and 40 degrees north of the equator, wherein dwell a majority of the world's Moslems. Chinese Christians are exploding with missionary zeal. American Christian missionaries are going to persuade them to redirect a good portion of their energy towards the Moslems and ex-Christians of Old Europe. New Europe, freed from the Soviet prison, is currently undergoing a Renaissance of Christianity. New European Christians will be next to join the alliance to save the Old European heathen. Terrified of the Islamization of Old Europe, disgusted by Islamic crime-ridden slums, bitterly angry at the jihadi murder of Theo Van Gogh in Holland, millions of Old Europeans are ready to embrace Christianity again, and to demand that if they want to continue to live in Europe, immigrant Moslems must do the same. History is moving in profound ways. The coming Missionary Alliance promises to prevent Europe from becoming Eurabia, teach Europeans how to be true Christians again, and bury the anti-Semitic vampire. The only way for Old Europe to cease being old is to be Born Again. how does Buddhism or Taoism not satisfy the belief that they crave? Communism isn't a religion. it shouldn't be expected to do that. I fear that with Christianity getting more popular, China's native religions may be forgotten. StereoMike Wrote: how does Buddhism or Taoism not satisfy the belief that they crave? Communism isn't a religion. it shouldn't be expected to do that. Mike, read the first link there, entitled Chinese Crusade. Wheeler talks about that very thing. Well awesome. I guess my fears are correct. I am scared of this Wheeler individual. He seems to be incredibly anti-Islamic. I don't see what your fears are for. BTY, here is an interview on National Review, of David Aikman, an expert on Chinese Christianity. His points are interesting. I am afraid of this wheeler individual. He seems to believe he can "defeat" Islam thought his Chinese crusade. The only things this crusade can do is strengthen Islamic xenophobia or destroy the Islamic religion. Both are sad outcomes. StereoMike Wrote: I am afraid of this wheeler individual. He seems to believe he can "defeat" Islam thought his Chinese crusade. The only things this crusade can do is strengthen Islamic xenophobia or destroy the Islamic religion. Both are sad outcomes. Poor Mike. I think that you are looking at all the wrong threats in all the wrong places. I was commenting on that Wheeler article. StereoMike Wrote: I was commenting on that Wheeler article. So is Palladin/Patrick. I have not seen you worry about him, and he is closer to you by being here. I've never really had any interaction with Palladin. I don't really see how saying that proves anything. Other than there being another racist I didn't know about. Wheeler was advocating a spiritual crusade which he described as what would be the main threat to Islam. That's not something I can stomach. Quote: I don't really see how saying that proves anything. Other than there being another racist I didn't know about. Mike, stop drooling your liberal slobber all over the place. Islam is not a race, it is a belief system. People cannot change their genetic character, but they can change their moral character. Racism is wrong because it maligns benign physical attributes which a person cannot change. A belief system is something that is adopted, and can therefore be changed. Criticizing people for their belief system, when you're being factually accurate, is perfectly legitimate. Maybe they will change, or maybe not. But it's all about a free-market place of ideas, and who can persuasively articulate their view points. Oh ho ho! my liberal slobber? You don't seem to appreciate religion at all. I know it's not technically racism, but it is the same ignorant, idiotic viewpoint that leads to the kind of thing Wheeler is talking about. I don't know if you read the article but the man wants the Chinese Christians to completely eradicate any belief in Islam. If this article was directed at Christians, wheeler would be labeled as a hate-monger. Am I anti Islamic? Hell yea! Who in their right mind now ISN'T? I think there are MUSLIMS who are beginning to wonder. No,that don't mean they all are exploding bombs,but how MUCH of this murderous behaviour do we need to FIGURE out there is something about that religion that easily lends itself to radical people who like to murder? There are probably many Christian fanatics,but they don't go murder Mike's mother because Mike argues with them. Mike,tell me where within "Christendom" officials are hidden and protected because they denigrate Christians or Christ like Ducth elected officials are hidden in their own nation from Muslims? Are you afraid of some terrorist Christians? I doubt it,what you're afraid of is Muslims getting mad at Christians like Jack Wheeler and you happen to be around,right? Now,let's have anyone tell the board which religion in modern human history has ever had chaos and war at every point of where it's people live? From east Asia to the USA and all in between? Hinduism,Christians,Zoroastrians,Buddhists? I challenge anyone here to give me an example. OF COURSE Jack Wheeler is anti Islam,he is a realist. I wish Islam WAS a religion of peace,but the fact is Islam teaches PEACE after the infidel is subdued,it's right in the Koran. Dar es Salaam is where they rule,Dar es Harb is where WAR is because Dar es Harb has not converted. Do some research guys. Why would Mohammad have called all non Muslim regions "WAR REGIONS" if the da.mn guy preached peace and understanding? It's Past time we start opening our eyes folks. All of us. Concerning China. 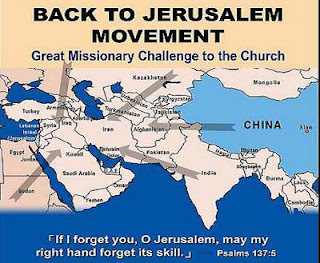 I had read sometime back about the "Return to Jerusalem" movement. Jack may be exaggerating the level of Christianity in China,I hope not. IF the facts are sound,China will be poised to overtake the USA as God's "client nation" when ever we falter and stumble. Hope that's a long time from now. Could be Osama is going to have another enemy state he didn't count on. Every religion needs a reform eventually. Not an eradication like is proposed within that article. No one here seems to be noticing my position. And that would be terrible. Have you read the Tao? China's original Mythology is already incredibly hard to find within mainstream society. StereoMike Wrote: I fear that with Christianity getting more popular, China's native religions may be forgotten. Stero, substitute" Liberalism" for "Christianity," and "America's conservatism " for "China's native religions" to see how ridiculous your statement sounds. I wouldn't want to see any set of ideals destroyed, we need all of them. Were we to have one way of thinking about everything no progress would ever be made. I don't mind Christianity anywhere, but when it starts organizing crusades designed to convert the followers of another religion, that's when it starts to get out of control. That's what Christ commanded Christians do. We believe He is GOD,so we really aren't in a position to concern ourselves with the fate of other religions that could go KAPUT if say Buddhists in Thailand converted to Christ. It's all voluntary. I wouldn't worry about the native beliefs,they seem to persist,we still have Indians here and in Canada who believe the old ways.